Check out the best stuff from San Diego Comic-Con 2017. 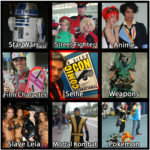 From cosplay, to collectibles, to celebs, and more. You're sure to find something cool.